The best annuities continue to recover rising over 10% across the board since reaching an all time low in August 2016 following the Brexit vote result and are now higher than levels before the EU Referendum. Providers of both standard and enhanced annuities have been increasing rates and are now higher than they were before the EU Referendum. The recovery follows large increases in 15-year gilt yields that reached an all time low in August 2016 of 0.90% and they have since recovered 95 basis points to 1.85%. 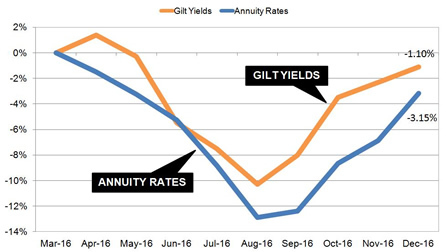 Annuity rates are mainly based on gilt yields and we would expect a rise of 9.5% and actually providers have exceed this level. Compared to the levels in March this year annuities are still slightly behind yields so some further improvement is possible. The fall in yields occurred after the Brexit vote with political and economic uncertainty with a recovery due to investor expectations for future interest rates and inflation. For some annuities increases are higher such as for those aged 60 to 65 buying a single life, 3% escalating rate up 12.1% since August 2016. 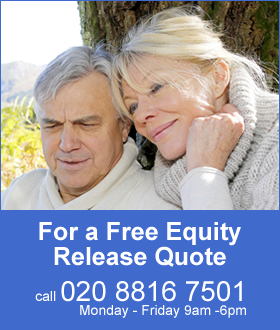 For those aged 55 buying a single life, 50% or 100% joint life, level annuity have increased 11.7%. The above chart shows how yields and rates for our benchmark example reached an all time low in August 2016 after the EU Referendum and have recovered since with 15-year gilt yields up 95 basis points. Our benchmark example for a person aged 65 with £100,000 buying a single life, level annuity would receive £4,696 pa in August rising by 11.1% or £475 pa to £5,221 in December. There remains a gap which suggests annuity rates can still improve by 2.05%. For the benchmark example in terms of lifetime income, the Office of National Statistics (ONS) would expect a male to live for 17.3 years and he will have £8,217 more over his lifetime. For a female she can expected to live for 20.4 years increasing her income by £9,690. There is some margin for small increases if the 15-year gilt yields remain at this level and unlikely to change until 2017 with further developments in the main drives of higher rates. Donald Trump takes the office of President from 20 January 2017 and is expected to increase infrastructure spending and tax cuts with investors anticipating the federal Reserve to raise interest rates and higher inflation. Investors expect a higher payout from bonds and gilts if there is inflation to offset the reduction in real rates of return which will lowers prices and send yields higher. Inflation is likely to increase with OPEC and other oil producing countries cutting the supply of crude-oil which may see the price rise from the current level of $50 a barrel. Investors expect central banks to limit future buying long-term government bonds and this is helping a selloff in bonds and driving yields higher. This could result in greater pressure for developed world economies to switch from a monetary to fiscal policy to increase growth. In the short term a further rise annuity rates is possible as providers are more aggressive at pushing annuity rates higher.